Citing anonymous sources, Bloomberg reports that the company is trying to secure contracts for several thousand tonnes of cobalt for five years or longer. Electronics and car makers are racing to lock in supply agreements for cobalt amid fears of shortage. Negotiations are said to be in a preliminary stage, which means Apple may end up deciding not to go ahead with a deal, the article says. The news underscores concerns that rapid growth in batteries demand may lead to a shortage of the raw materials needed to make them, particularly cobalt, lithium ad copper. It also comes just a week after Samsung SDI, South Korea’s leading battery maker, unveiled plans to recycle cobalt from used mobile phones and develop lithium-ion batteries with minimum content of the metal, or no cobalt at all, as a way to offset soaring prices for the silver-grey commodity. 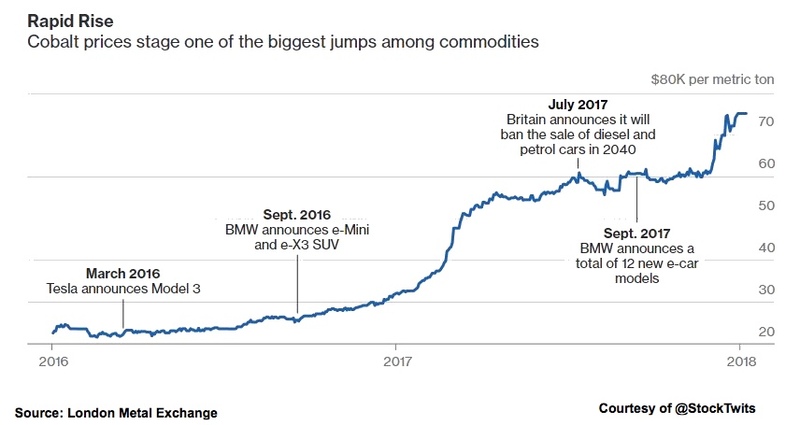 Cobalt prices went ballistic last year, with the metal quoted on the London Metal Exchange ending 2017 at $75,500 per tonne, a 129% annual surge sparked by intensifying supply fears and an expected demand spike from battery markets. If anything, prices for the metal are expected to rise even further this year, as the Democratic Republic of Congo, responsible for more than half the world’s supply, recently hiked its taxes and royalties on the metal. Cobalt demand from the electric vehicles industry is also forecast to grow from to 95,000 tonnes by 2026 from 12,000 tonnes last year, according to consultancy CRU. BMW, for one, recently said it believes its needs for car-battery raw materials will grow 10-fold by 2025 and that it had been surprised by “just how quickly demand will accelerate”. Apple has increased its engagement with cobalt miners in recent years due to scrutiny from international human rights organizations. According to Amnesty International, about 20% of the cobalt mined in Congo is extracted by hand by informal miners including children, often in dangerous conditions.